With its first amplification separates -- the brand-new C200 preamp and M100 monos -- Raysonic Audio from Toronto now aims higher. 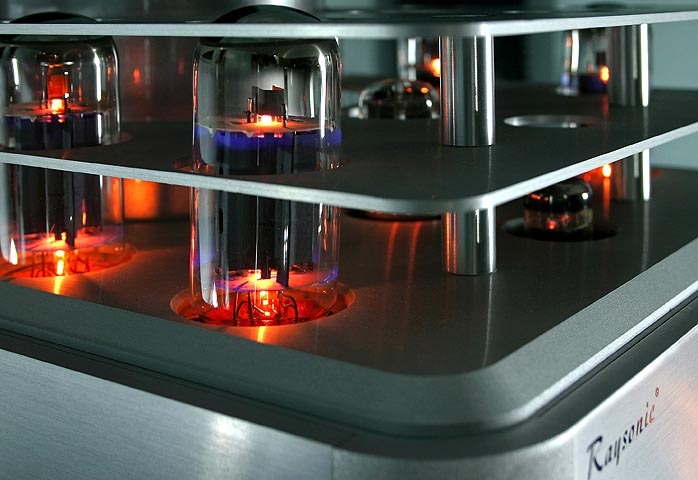 They want to be regarded as purveyors of heavyweight fi for advanced audiophiles. No longer content to remain misjudged for yet another entry in the endless parade of affordable Asian-built valve integrateds, our makers from Canada's cold White North have jumped that claim for a stake in something loftier. Hence there's nothing transitional about their new models. Forget entry-level. The rising young company first demonstrated such ambitions with their overachieving $1,699 Raysonic CD128. Its launch should have keyed in astute bystanders. Raysonic was gathering momentum. They were planning to push forward and up. Their luxuriously fitted top-loading CD player with curved tube trench housed four 6922s for balanced outputs and introduced the firm's flawless round-cornered chassis. That enclosure is an exquisite exercise in subtle surface textures and flawless mill work. It now returns in the standalone 6-tube preamp and -- narrow side forward -- becomes the companion 100-watt 8 x 5881 high-power monos. The new CD168 maintains the CD128's appearance but uses two Burr Brown PCM1792 24/192 DACs for fully balanced operation starting at the converters. It also adds remote-controlled variable outputs for optional amp-direct connection. And because the preamp itself lacks remote, the CD168's variable gain can be used to trim the C200's master volume from the chair without defaulting to an inferior motor-driven pot. This could arguably be the slicker solution for remote volume without invoking expensive optical encoders - set the median gain at the preamp, tweak small offsets in the digital domain at the source. At T.H.E. 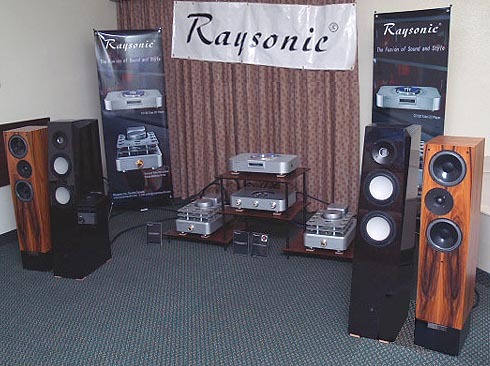 Show in Las Vegas 2007, Raysonic's domestic distributor Steve Monte of Quest for Sound introduced a visually integrated quartet with the CD128 as source at the St. Tropez. Gone was the somewhat noisy color scheme of bronze and silver of the earlier models. Gone were the futuristic tube chimneys of the integrateds. Gone were the older stainless steel casings which were always prone to discoloration from skin oils. Gone were the low two-digit SET power ratings, too. This was a new page; a new beginning altogether. Serious Fi. rather Don Garber-ish stacked plate architecture to shield their output valves. This retains access both visually to enjoy their glow and physically to get at the glass bottles. All the latter takes is a quick undoing of four bolts and standoffs. Even the backlighting has toned down. The ubiquitous Shanling blue has muted to what strikes me personally as a far more becoming orange- which additionally picks up on the tell-tale thermionic emissions for echoed tube glow. 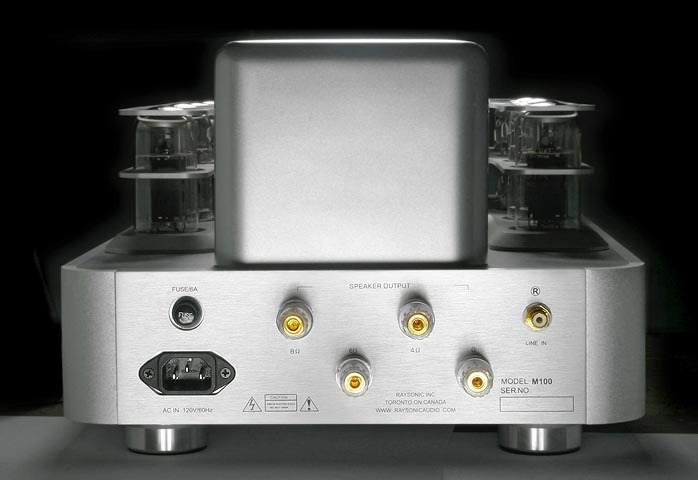 As stable mate to the CD players, the new preamp curiously doesn't sport a single balanced input. Its socketry is single-ended only for three inputs and two paralleled outputs. Input Z is 100KΩ unbalanced, output Z approximately 20KΩ. S/N ratio is given as better than 90dB A-weighted, gain as 20dB. Preamp tube complement is an unusual mix - two 12AX7 and 12AU7 each, one 12BH7, one EF86. "To achieve wide dynamic range, the input and buffer stages of the C-200 use one 12AX7 each for broadband amplification. In addition, direct coupling is employed to minimize low-frequency phase distortion." "The output stage is using a single 12AU7 per side as a double cathode follower. This approach lowers the output impedance, achieves more extended frequency response and noise rejection and enables the C200 to work with most common transistor or tube-based power amplifiers. The C-200 also makes use of one 12BH7 and EF86 each as part of the voltage regulator for exceptional longevity and reliability." The amplifier's input impedance is 250KΩ. Output taps are 4, 6 and 8 ohms. 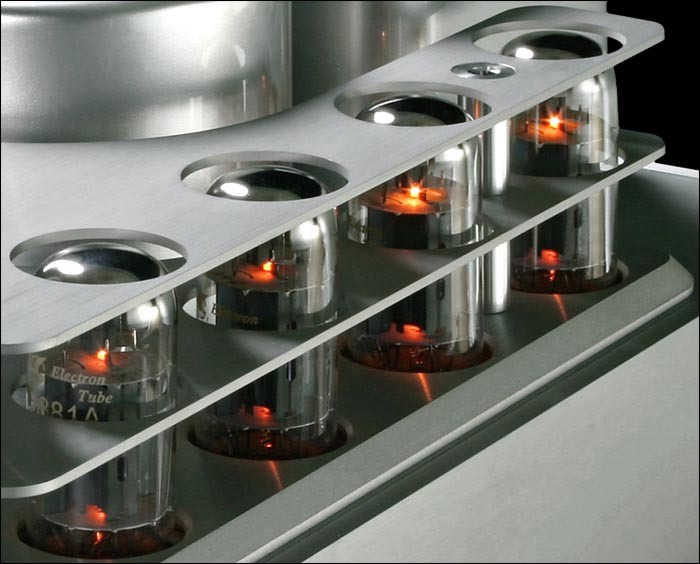 Tube complement is one 6SN7 and 12AX7 each and a whopping eight 5881 (or EL34/KT77) per channel to make a claimed 100 watts RMS of auto-biased Class A ultralinear power. That spec sits in the heart of ARC, CJ, Rogue or VTL country. Just four EL34 in push/pull usually net 100 watts. Here we're using twice that artillery. Dare we assume that the stacked dress plates serve double duty as thermal dissipaters for the throwaway heat of Class A bias? "The 5881 output tube is using a relatively low plate voltage of about 23-25 watt. To achieve an output power of 100 watt in this amplifier, four pairs of 5881 beam power tube are employed. This reduces plate resistance by a factor of 4, hence we can increase the damping factor of the amplifier and the slew rate of the speakers being driven. Most high end audio amplifiers resort to a plate cathode as phase splitter. The drawback of this approach are inconsistent output impedances between the positive and negative halves of the wave form which cause a plate cathode-based amplifier to exhibit significant distortion in the high frequency range. 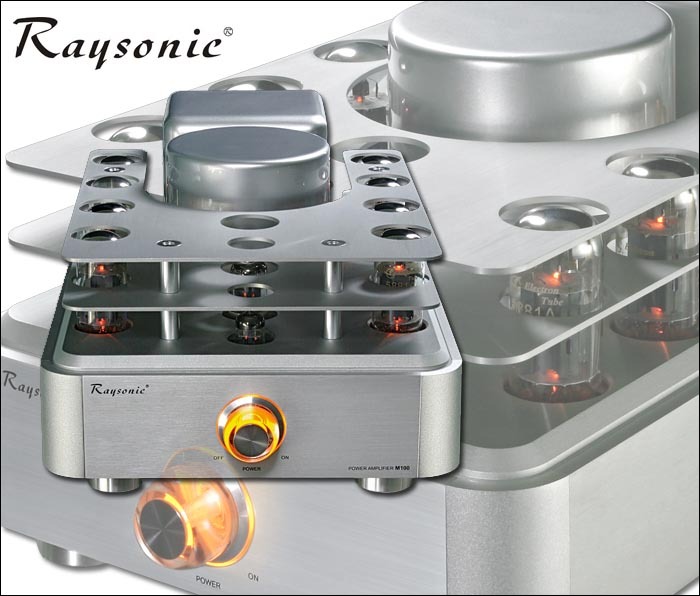 The Raysonic M-100 uses a cathode-coupled phase splitter instead to eliminate those issues." 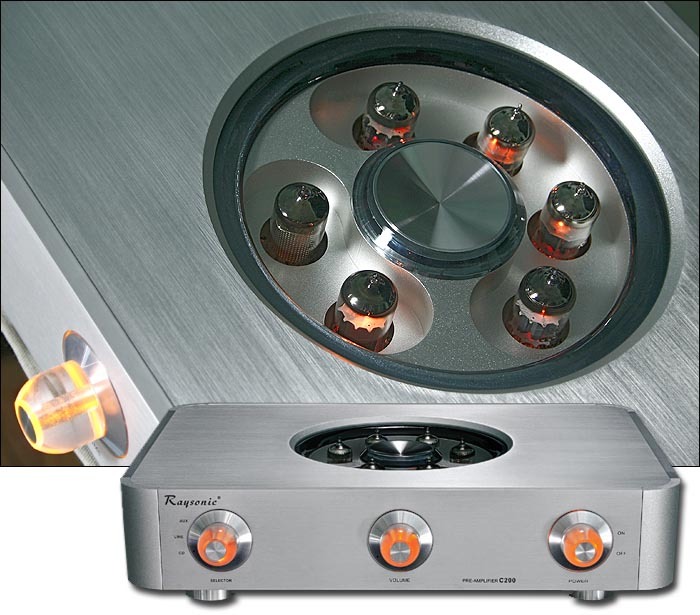 At nearly $8,000, Raysonic's monos have scaled to a very different plateau from the previous +/-$2K valve integrateds. This is serious coin. You fully anticipate it from the established players. From Raysonic, you could find it cheeky, ambitious or plain steep. The latter would seem so only because the CD128 was crassly underpriced. Had it been the far more realistic $2,499 it should have rightfully been, nobody would have caught her breath then, nobody would bat an eyelash now. The new preamp would have hunkered down right next to the digital machine a mere $200 removed and voila - brothers from the same mother in looks and price. As is, brand expectations have probably gotten somewhat skewed. Raysonic's low-ball bid to roll out its forthcoming series with the early intro of the CD128 in mid 2006 might have sent the wrong message. That's my read at least. Treat these sleek new pieces now with the full intent of purpose and no-holds-barred critique their ambitions suggest. This stylish kit wants to be treated as upper crust. The question, very simply, is whether it has what it takes to belong there and -- particularly with the amps -- see itself priced accordingly. But first, who is Raysonic? I turned to my contact Steven Leung. 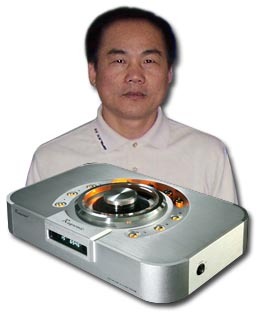 He had originally introduced me to his company soliciting the CD128 review. This had brought Raysonic from zero to hero literally overnight - at least in my book. Two reviews later however, I still knew far less about the outfit, its engineers and such than seemed appropriate. Without foreign correspondent Warwick Freemantle standing by On Assignment to do a Raysonic factory tour as he did for us on Melody Valve HiFi in mainland China, I'd have to depend on Mr. Leung himself to shed photographic and other light on the operation and its key members. From the company's T.H.E. Show 2007 profile registry, one would know that "Raysonic owns its production facilities, hence all products are developed and manufactured under our own strict quality control supervision. 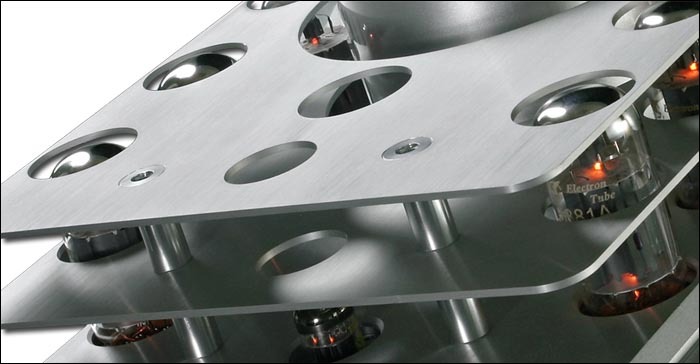 By the end of 2006, Raysonic will have added its own CNC metal cutting, forming and fabricating machinery to insure complete in-house quality production. 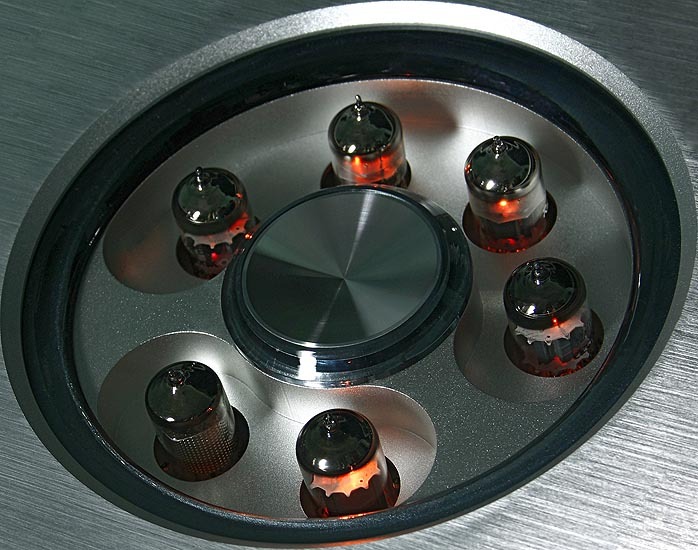 Our design team includes voice specialists and audio engineers who are well versed in tube and transistor amplification and production experts who excel at making quality products." What else would Raysonic's owner be willing to divulge?